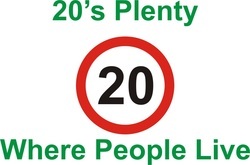 Total 20 – signed, town wide 20mph limits - is a transport policy that hits many buttons – safety, health, environment, community, prevention, obesity, pollution, cycling, walking, asthma/ lung health, heart disease, mental health and noise reduction whilst also saving society money. It is more effective than single roads or zones as the simple, common message is easier to remember and drivers are not tempted to race in other streets. Already over 12 million people live in local authorities which are adopting or have adopted this policy. Most importantly, through democratic debate those communities have decided that "20's Plenty Where People Live". And it is those same communities who have then changed their behaviour to drive slower in residential streets and where people walk and cycle. These ‘total towns’ include many similar to Crewe, including Bath, Warrington, Southwark, Chichester, Wigan, Bury, Bolton and Rochdale. 71% of respondents to a DFT survey favoured 20mph limits, which are now easier to legally implement. A report from Public Health England on Obesity and the Environment, increasing physical activity and active travel produced just last month, is particularly important to Crewe with its poor health record. Crewe residents have the worst life expectancy and are significantly more obese than other areas in Cheshire East, or nationally. In the Crewe LAP area, 22.1% of 4-5 year olds and 36.3% of 10-11 year olds are overweight. Compare this with 22% of London’s obese 10/11 year olds. The situation is getting worse as protective parents stop children from going about by themselves. Exercising one hour daily is recommended for kids, yet with most not allowed to walk or cycle alone due to mum and dad’s concerns, few are active enough. Nearly half of year 11 pupils (15 year olds) are unfit. This raises the risks of many other health problems such as heart disease. Scrutiny (a.k.a Task & Finish/Best Value Review) in Greenwich, Brighton, Gloucester, Richmond-U-Thames, Haringey, Manchester, Darlington, Hartlepool and Warrington all rate 20 mph limits as a best value policy. Children and families are big winners from slower speeds. 20mph zones will help parents and children to get around locally. Less danger or parent ‘taxi-duty’ and more walking and cycling means happier, healthier families with extra money to spend. Child protection should focus more on slower speeds because crashes are the top avoidable cause of early death or injury for 5-35 year olds. Some children are not allowed to go out without an adult because of fears of being run over. Leading expert Professor Danny Dorling says “roads imprison richer children at home, denying them the freedom to move and are the main sites of killing of poorer children”. Child road safety education might seem a partial solution. But, although it can change behaviour, studies show that education has not reduced traffic crash rates. Eye sight development explains why being near fast traffic is risky. Vision scientists found that 6-11 year olds cannot reliably see, or accurately judge speeds over 20mph. The World Health Organisation says wide area 20mph limits help protect walkers. Public health body NICE advises 20mph limits near children. At 20mph the risk of death is 7 times less than 30mph. There is extra time to get out of the way or brake. Just 20% of child casualties happen on school journeys. Yet until recently, transport officials had focused on engineering slower speeds with humped, school zones. But, humps are costly. They result in confusing limits. For example the Somerville Road speed bumps are not 20mph and only protect a few hundred metres near schools (about 17% of a school trip). Zones encourage parents to drop off in the “safe area” and then remind them to speed up on leaving it. Wide 20mph limits are better because people who walk or cycle the journey enjoy a 20mph limit throughout the majority of their route. Noise levels fall by 50% too, plus it's popular and good for the environment. Slower speeds are key to more walking and cycling. Bristol found +20% increases in both, in their 20mph limited areas. Driving children around is also costly. A survey of 2,000 mums in 2012 by a child safety seat firm found that they spent an average £1,714 a year on fuel to transport children and 6 hours 43 minutes driving weekly. Even 15 minutes each way twice daily is 5 hours a week on the ‘school run’, or 195 hours a year. Letting children walk or cycle could free up a lot of time and money. Some adults could use that time to earn income. Britain has the highest percentage of pedestrian road fatalities in Europe at 24%. and one of the lowest levels of children walking or cycling to school in Europe. British parents consistently cite traffic speed as the main reason why their children are not allowed to cycle or walk to school. Lowering urban and residential speed limits to 20 mph has been found to increase urban journeys by just 40 seconds maximum. See the "myth busting" page on "Slower Journeys"
At the same time it decreases child pedestrian accidents by up to 70%. In Portsmouth the 20mph limit on all residential roads has reduced casualties by 22%. Pedestrians account for 24% of all road deaths which is one of the highest in Europe. Only a few roads around Crewe are restricted to 20 mph, such as Ford Lane and the Nantwich Road. Regular users will know that this is only enforced by congestion. If all our residential roads were 20 mph drivers would adapt and speeding would become unaceptable. According to the TImes last week, cities across the north of England are leading the way in demonstrating the future of urban bike travel. However, as city councils’ budgets are cut, building cycling infrastructure that saves lives could drag on for years. Last week, on 1st Dec, ten cities threw their weight behind The TImes manifesto for Cities Safe for Cycling. They were Liverpool, Birmingham, Leicester, Bristol, Newcastle, Manchester, Glasgow, Leeds, Sheffield and Belfast. Later, Brighton and Hove, Salford, Middlesbrough, Cambridge and London did the same. Liverpool, Manchester, Leicester, Bristol and Brighton plan to extend 20mph zones across city centres. In London, police enforcement has been stepped up against careless road users. In Manchester, the city council has already secured funding to tackle the dangerous junctions on the inner city ring road. In Salford, the city council plans to invest £1.2 million in improving cycle routes and safety over the next three years and plans to create five cycle routes to the Quays. A cycling route linking the northeast and northwest of Liverpool was also opened this month. What costs and benefits would it entail? How could we make it happen? Some blogs are the personal view of the writer, Ben, not of ACT. Ben rides across Crewe every day for work or pleasure and is committed to making our roads places were adults and children feel safe to cycle.